A while ago, I wrote a couple of columns (see here and and here) about how Indian science is producing Dr. Watsons instead of Shelock Holmeses. It is indeed a puzzling matter that despite a huge investment of resources and prestige, post-independence India has produced fewer major scientists than pre-independence India. Where are the C V Ramans and J C Boses? To accuse the Indian scientific establishment of mediocrity is besides the point. Why are we mediocre? Part of the problem lies in the manner in which we engage with scientific ideas. While one can do good science without concern for the underlying philosophical and theoretical principles, great science invariably requires a deeper understanding of the foundations of the particular discipline, which in turn forces the scientist to engage with the founding thinkers of that field. In this article and the next, I am going to use Darwin - whose bicentennial is being celebrated right now - as a lens to view the Indian engagement with major scientific ideas. The nineteenth century produced three bearded white men - Darwin, Marx and Freud - who have been celebrated as prophets by some and reviled as monsters by others. Of the three, Freud has almost no intellectual presence in India. Freud's absence is not surprising, for his contributions were the most intimate of the three, being as they were about the human psyche and its inner life. We Indians have our own gurus for that purpose. Marx on the other hand has been immensely influential. A party carrying his name is in power in two Indian states. Modern Indian society and its politics are impossible to imagine without Marx baba peering over our shoulder. While Freud was rejected from the beginning, generations of academics and politicians have been trying to domesticate Marx into an Indian guru. I leave it to the reader to decide whether we have succeeded or not in that task. That leaves us to ponder the fate of Darwin, the most scientifically significant and cosmologically radical of the three Victorian sages. Unlike Marx, he has not spawned any political parties, but unlike Freud, he remains taught and celebrated amongst the scientists of India. So what has Darwin done for India? The first thing to note is that the larger theological controversies that make Darwin a household figure in the west are mostly absent in India. No one has tried to prevent Darwin from being taught in schools or funded an institute that mounts a pseudoscientific defense of creationism. The idea that humans are continuous with other species is, for the most part, both theologically as well as philosophically acceptable to Indians. Unfortunately, controversy also drives fame. Darwin is famous in the west because he challenged and continues to challenge the dominant Christian ethos of those societies. In India, he challenges nothing. Darwin becomes a far less influential figure without the general challenge to the Biblical worldview in the background. Indeed, it seems as if asking about Darwin's influence on Indian thought and practice is almost incoherent. After all, we do not ask the question "What does Newton mean for India?" or "What does Einstein mean for India?" We admire those two scientists for their contributions to our understanding of the physical world and leave it at that. There is no debate about the impact of Einstein and Newton on Indian culture and society. As far as we Indians are concerned, is Darwin any different? At one level, I think that in India Darwin is just another scientist, a man with revolutionary insights, but not someone who enters into public debates about the nature of humanity, society or the cosmos. Once again, the contrast with Marx is apparent; while Marx's claims about the Asiatic mode of production are still considered as scientific truth by card carrying Indian Marxists, we do not find a similar cadre of Darwinians trying to spread his message to the Indian masses. Darwin is a total flop as an originator of street protests and popular slogans. This is all to the good, for he was primarily a thinker, perhaps the most insightful of all scientific thinkers. Arguably, a thinker should be judged on his ideas and his arguments, not his impact on popular consciousness. I think the two hundredth anniversary of Darwin's birth and the one hundred and fiftieth anniversary of his most famous book is an occasion to think deeply about the following question: "how should Indian intellectuals engage with thinkers from outside our shores?" Here, the case of Darwin is an instructive example. To use an evolutionary turn of phrase, while I believe that Darwin's ideas had important consequences for India, these influences are all spandrels, i.e., unintended consequences of adaptations whose original purpose was rather different. Let me state my apologies in advance: this is not a well researched historical claim, but rather an imaginative reconstruction of how Darwin's impact on western culture created openings for Indian thinkers. Vivekananda's eloquent defense of Vedanta at the world council of religions in 1894 would not have had the impact it had if Christianity had not lost its lustre as an account of human origins. 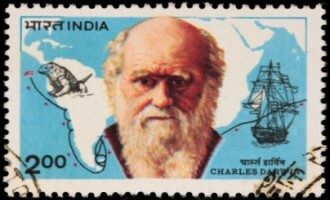 Darwin was a scientist and his intended audience was other scientists, but it is clear that very few Indians (or for that matter, very few westerners) understood the scientific content of his claims. Darwin appeared on our shores primarily in the guise of philosophy rather than science. Evolutionism as a philosophy claims that nature in its various aspects is an evolving rather than static entity. Evolutionary philosophy has been associated with various discredited ideas, racialism being the most prominent. The superiority of the white race and of the imperial project was often justified in Darwinian terms. So Darwin certainly had an unfortunate indirect consequence for Indians and their imperial rulers. However, I also think he had an equally indirect but creative influence on late nineteenth and early twentieth century India. I think that the Indian response to western science was itself shaped by the internal critique of western intellectual traditions initiated by Darwin. It is hard for us to understand the impact of western science and technology and the superior methods of social organisation in the west on nineteenth century non-Europeans. Even if we lack the latest computers we are quite aware that a world of high technology exists and people like us might be able to access that world. However, the nineteenth century was different. Railways, tanks and telescopes transformed human control of the natural world in an almost magical manner. In comparison, Indian intellectual traditions looked like superstitions to their critics and profound metaphysics untouched by empiricism to their admirers. Indian thinkers from Rammohun Roy onwards had to engage with western developments and reconcile them with their own understanding of Indian intellectual traditions. Several influential questions emerged in that period. Is science only compatible with western intellectual traditions or are there alternate routes through Indian and other intellectual traditions? In the face of withering criticism of their traditions from westerners, some Indians claimed that the Vedas contain much of modern science - a trend that has persisted even though the science in question itself has changed. Others such as Vivekananda and Radhakrishnan agreed that western science is superior in its understanding of the material world, but Indians have a better understanding of the spiritual world. Every Indian thinker of the late nineteenth and early twentieth century had to engage with this problem - is science compatible with Indian intellectual traditions? Darwin was the major western scientific thinker of that period; surely Indian responses to western science was coloured by our understanding of Darwin. Keeping in mind that what follows in the next few paragraphs is a plausible reconstruction rather than actual history, let us ask ourselves how Darwin might have enabled the creative output of late nineteenth century Indians. Darwin's primary effect on western culture was on its religion and its theology. Outside a few biologists, very few people cared about the detailed content of Darwin's work. However, it was clear from the publication of the Origin of Species that Darwinian explanations of animal and human evolution were incompatible with Christian theology. Fortunately for late Victorian Indian thinkers, the indigenous Indian religious traditions did not share the Bible's assumptions about the nature of man. Darwin's challenge to Biblical theology gave an opening to many an Indian thinker to say that Indian religions are compatible with science, and perhaps even supra-scientific in their investigation of the spiritual realm. Buddhism and Hinduism emerged as religions compatible with science at about that time. I think Vivekananda's eloquent defense of Vedanta at the world council of religions in 1894 would not have had the impact it had if Christianity had not lost its lustre as an account of human origins. In contrast to the 'text and belief' centric approach of Christianity, the Asian religions with their emphasis on meditation and mystical experience seemed much more scientific. As we know, at that time Bengal was the centre of India's experience of the west. It is in Bengal that Indians first leant to respond creatively to western pressures, a response that often took the garb of a spiritual revival, since Indian religions were beginning to be seen as better than their western counterparts by educated Indians well as some westerners. Consider a figure like Ramakrishna, who, as we all know, is a seminal figure in this Bengali spiritual renaissance. He is often talked about as a spiritual Darwin or Einstein. Note the delicious contrast: while western religion was textual, here was a Hindu who personally experienced the truth of all religions. Hinduism is suddenly transformed from being dominated by caste and superstition to being the highest experiential truth! The tide had turned; Christianity was now the unscientific belief system while the Indian religions were based on experience. Would this have been possible without Darwin? Even now, if you look at the interest in Buddhism amongst western intellectual classes, it is because post-Darwin and post-Freud, they can no longer believe in the teachings of the Bible. In the case of Buddhism in particular, we can see the transformation of Buddhism from being a multi-faceted religion with all kinds of rituals and customs into a rational exploration of experience. The rationalised religion at the heart of western Buddhism was constructed by post-Darwin Englishmen tired of Christianity. Ambedkar and his followers used this rationalised Buddhism as a weapon to counter Brahminism. Perhaps Darwin has indirectly influenced Indian politics and society as much as Marx and if anything his influence is on the increase! I am of course being tongue in cheek here, but I do think that certain characteristically modern attitudes towards Indian culture - now internalised by the Indian middle class - such as the emphasis on its spirituality, its knowledge of the mind, its ancient wisdom, would have been impossible if Darwin had not dislodged Christianity from its pre-eminent status. Without Darwin, it would have been easy to make the argument (as some have still done) that Christianity is the backbone of western modernity. After Darwin, Christianity has irrevocably acquired the tinge of being unscientific. Darwin's internal critique of the western worldview freed Indian thinkers to appropriate science creatively for their own purposes. However, the output of that appropriation - India as a spiritual civilisation, the superior understanding of the mind etc - themselves seem a bit quaint now. Science has changed beyond recognition in the last hundred years and arguments about Vedanta and science that seemed revolutionary a hundred years ago seem backward when couched in terms of the similarity between modern physics and Indian spirituality. The west has not outgrown its selective post-Darwinian flirtation with Indian spirituality, but we need to take another look at the possibilities offered by Darwin to us now. We cannot be satisfied with spandrels anymore; Indians have to engage with western thinkers directly, while still being critical. In the following article , I outline my ideas about how a more direct engagement with scientific thinkers is possible.